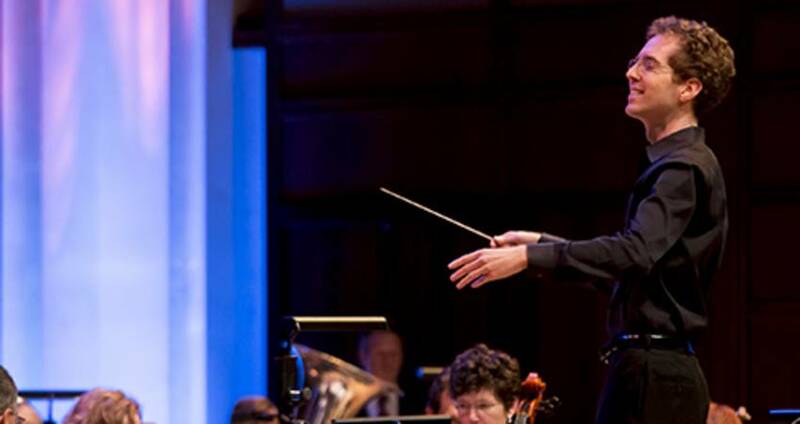 David Glover joined the North Carolina Symphony as associate conductor in the 2014-15 season. Now with a full year under his belt, we wanted to check in with him and his experiences with the orchestra. Q. What are your duties as associate conductor for the North Carolina Symphony? A. I do a great variety of things. I conduct on most of the major series that the orchestra presents: education shows, family shows, pops shows, road shows; you name it, I&apos;m doing it. They keep me very busy. Off the podium, I often serve as the cover conductor, attending rehearsals, listening for balance, noting how it sounds in the hall, because it often sounds different there than to the conductor on the podium. Of course, if anything were to happen with the conductor I am covering, I know the score. I also go out into the community doing lectures and meeting people. Q. You started out your musical life as a violinist. What age did you start? What led you to conducting? A. I was trying to conduct before I even played an instrument. I saw a Mostly Mozart concert on PBS and thought it looked fun, so I picked up a toy xylophone mallet and started waving my arms from a tree-stump in the front yard. Fortunately my parents thought that if I was interesting in conducting, then maybe I should play an instrument. They asked what I wanted to play, and I chose violin at age five. Growing up in Athens, Ga., I went to a pretty small high school, so while I played in the orchestra there. It was made up of only 10 or so string players. Eventually, I started playing in the community orchestra in Athens, and that&apos;s where I played my first real symphonic literature. In college I was a performance major in violin, and I also did a master&apos;s in violin, then switched over to conducting. Q. You hold the Lucy Moore Ruffin Chair. Can you talk about the importance of donors and Endowed and Special funds to an orchestra? A. It&apos;s very important, because ticket sales don&apos;t cover everything it costs to put great music on stage. We need to have great donors behind us who believe in the mission of the orchestra, in the education programs we have, and in the quality of the musicians that we put on stage. We wouldn&apos;t be the orchestra we are without our supporters. Q. What&apos;s it like working with the musicians in the orchestra? A. In great professional orchestras like this, it is amazing when you think about the talent and dedication of each one of our musicians. The amount of study. The amount of practice. The sacrifices that they make in order to achieve the level required so that they can come here and win an audition against one hundred or two hundred of their peers. As I stand up in front of them, I&apos;m always in awe of what they bring to the table. Q. The North Carolina Symphony has one of the most extensive education programs of any U.S. orchestra. Talk about those very special concerts. A. Every time you go out on the stage, you hope to inspire someone to go further into the musical world, whether it is picking up an instrument and trying it themselves or to just go explore all the great music that is out there. That&apos;s what we hope for with each of these concerts. When you get on stage and you see all these kids, that&apos;s an inspiration for us. See a North Carolina Symphony performance this season in Raleigh. Check the schedule here. This post is in celebration of 31 Days of Art, an Oct. full of artful events.